Info: Third CD edition, first time in digipak including 8-page booklet with all lyrics. 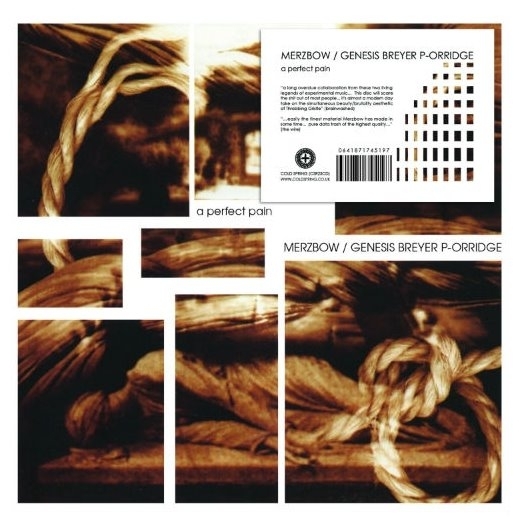 The incredible power created by GENESIS BREYER P-ORRIDGE (Psychic TV / Throbbing Gristle) - the founding father of the Industrial world, and MERZBOW - the undisputed king of Japanese Noise. Recorded exclusively for Cold Spring in 1999 - "A Perfect Pain" has been hailed as an important album and an extremely successful collaboration. "A long overdue collaboration from 2 living legends... This disc will scare the sh*t out of most people... it's almost a modern day take on the simultaneous beauty/brutality aesthetic of Throbbing Gristle" (Brainwashed) "...easily the finest material Merzbow has made in some time... pure data trash of the highest quality..." (The Wire).